Here is the 240Z that I have done. The good news is that it is done. The bad news is that it has no template for the body or windows. Hopefully someone could make one since I am an old dog and this is one of the new tricks I have'nt learned yet. It use the sounds of the Jag XKE which most people will already have in their install. It does not require any other files. You will have to edit the class line since I have it in an SCCA Mod that I have been working on for too long. Conversion to GTL would be good! Hopefully it will get a racy type paint scheme some day. Yesss! 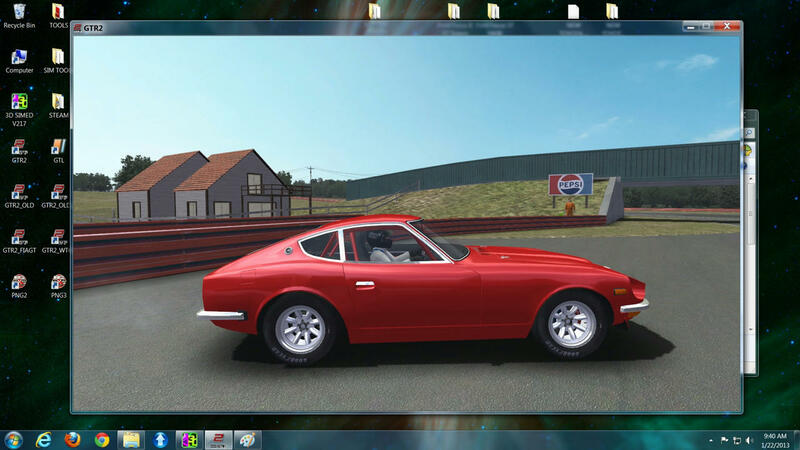 I have been waiting for a good 240Z in GTR2 or GTL! JD, I hope its not too much to ask, but is there a chance you could add a front airdam and rear spoiler/diffuser to make the car look more like they did when raced back in the day? Thank you JD it looks very good. I hope someone will do a template. 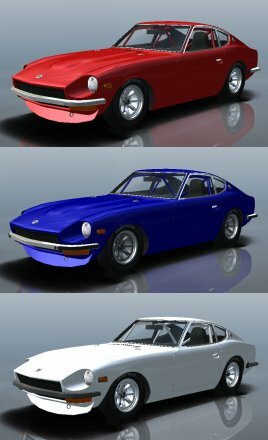 I think these two versions of the Fairlady Z are completely different cars. The front airdam is there. I had a rear spoiler on the car a long time ago but it must have gotten lost in the shuffle. I will look into it. So if anyone is thinking about making a template you may want to wait a few days. They are two different cars. I may know someone who can do the template. When you have the spoiler ready I'll send it his way. A template would be awesome. In the interim, here is the car, converted to GTL. As jd121449 stated, the sounds of the Jaguar are in the mod, and everyone probably has those sounds already. None were included in this upload. I've put my 240 in the GTC-65 class. If you choose other-wise, just modify the 'Class=' line in each of the .car folders. Here is the car with the rear spoiler. i will pack the fix a little later. Here is the small update. Includes new OBJ.GTR, new CAS file, new .car files and new genstring text. Just let it overwrite. It will give you the option of a rear spoiler or no rear spoiler. Thanks again for the car JD and now the update. Cheers MOF for your GTL conversion and Biks as it will save me a bit time doing it . @ GeeDee - you're welcome. MOF are you sure that you have the new car files with the 7digit genstrings. The Dl should have 3 car folders with just car files. 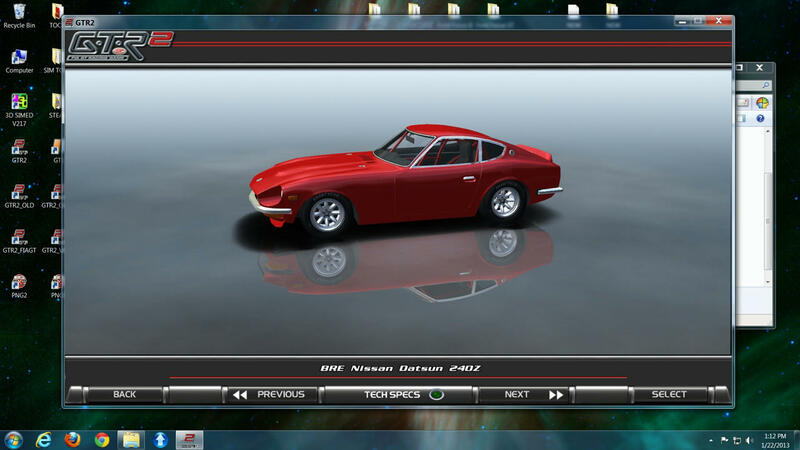 A 240Z.cas 240Z_OBJ.GTR and 240ZGenstring.txt. I just tried it and it seems to work for me in GTR2. Anybody else having problems? Yep, have exactly what you describe for GTR2, including the 3 new, altered 7-digit genstring car files. I suppose I could have gotten a bad download...I'll try again and get back to this thread with either a yay or nay on it working. EDIT - Well, I'll be hornswaggled...the first download must have been bad. The original GTR2 download with no rear spoilers worked. Added the update and and no such luck; as described in my post. Downloaded the update again, just now, installed it and it did work. Has spoilers on all but the white Datsun. Don't know what to say except I'm sorry to have jerked your chain for nothing. Deleted by MOF. See my first post that includes the rear spoilers, kindly supplied by jd121449. Thanks jd121449! I'll send this off and see if a friend can do the template. I'm having the same problem you did. When I go to the showroom in GTL all three of the cars. are invisable. Is any one else haveing a problem with the GTL version? MOF Would you mind uploading a complete 240Z with rear spoiler please. Done...see my first post on page 1. Because I had just reloaded my whole GTL those weren't in the Teams folder. Now that I added them back in all works fine. Thanks for the release of this legendary Z Car, JD ! And thanks for GTL version and updates, MOF ! This car is one of my most memorable cars because my father owned this car and I always sat in the passenger seat when I was a little child. So, this is a great feeling to drive this car in GTR 2 and GTL, and remember the good old days. I sincerely appreciate both of you as always ! This one was really missing to my collection, a proper vintage look 240Z. I have a close friend who currently owns two 240Z. Needless to say he will re-install GTR2 for this mod ! You made a couple of guys around here very happy with thhis release. Hope someone can help to make templates!